Home » an academic » Recycling » Technology » technology news » Once a Cell Phone; Now a What? Once a Cell Phone; Now a What? I am sure this is no news for gadget freaks, but our cell phones have gone smart people. What’s more, their smartness is not a steady state of being. They keep getting smarter and smarter by the minute. The mighty iPhone is already in its fifth avatar and its closest competition the Samsung Galaxy S in its fourth version. When it comes to staying abreast with technology, especially mobile technology, no one likes to be left behind. According to a survey conducted by Pew Research Center, around 91% of adults in America were using cell phones in 2013. The survey points to the rise of smart phones as one of the biggest reason for such widespread adoption of the cell phone. So, it hardly comes as a surprise that 56% of American adults own and use smart phones. Like I said, the smart quotient of the cell phones keeps increasing and with it increases our desire to own the smartest, the latest, and the most state-of-the-art phone. Hence, some of us actually end up changing our cell phones much quicker than our wardrobes. According to information available on this website, Americans change their cell phones most often in the world ditching their older ones for a newer model every 21.7 months. Now that’s a telling remark on our smart phone obsession. What Happens to My Old Phone? While you gleefully take out your glossy new phone from a sleek box, do you think about what happens to your old one? Does it get pushed to some corner of your cupboard to be disposed with regular household garbage whenever you happen to notice it next? I’ll tell you why that’s not the most desirable way to get rid of your old phone. If you throw your phone away in a regular trash can, it will most likely end up in a landfill where it will leak hazardous chemicals like lead, mercury, cadmium, beryllium, and nickel into the soil and water source. If it finds its way into an incinerator, the toxins will get released into atmosphere polluting the air. No & no! In fact, you could be breaking a law in some states if you decide to trash your cell phone this way. So, what should you do with your old cell phone? In one simple word, recycle! Recycling is the environmentally responsible thing to do with your old cell phone. By recycling, the same cell phone that would have been disastrous in a landfill becomes a rich source of materials that can be extracted, processed and reused. This reduces the demand for fresh mining of these raw materials, some of which are actually conflict materials mined from war-torn areas of the world. As for how the scrap from your cell phone is used after it’s processed, why it can be used to make a brand new phone or a variety of other items. Who knows the brand new model of the smart phone you’re holding in your hand was actually your old phone in its past life? It’s also possible that your cellphone is not just good for scrap. With a little bit of refurbishing, it can actually be sold in markets where the technology is not dead and buried as yet. Recycling is the Way to Go! When it comes to recycling your old cell phone, you’ve a few options that you can consider. There are niche private recyclers like Sims Metal Management that buy old phones and other types of electronics in addition to ferrous and non-ferrous metal scrap. 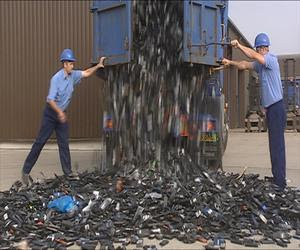 There are also organizations like Earthworks that run cell phone recycling programs, which allows users to mail their old cell phones to them. Earthworks also organize cell phone collection drives from time to time and pay $1 for each phone collected through these initiatives. Of course, there’s the option of donating your old cell phone to charitable organizations and helping someone less fortunate become part of this huge technology wave. This is the journey your cell phone takes after it’s been disposed by you. So, the next time your love affair with your current flame…err phone…ends, remember to recycle it! Anne Staley is an environmentalist who likes to express her thoughts and beliefs through the written word. Her motto in life is to better the lives of others through the knowledge she shares. She loves nature and urges her readers to go green. She shares her thoughts through creative writing and blogs. Thank you for reading Once a Cell Phone; Now a What? posted on the website Kwentology if you want to redistribute this article please include the link as the source. Have some kuwento to share? Contact us! Before you throw an alternate bit of e-waste into the refuse, reconsider. Something like 125 million mobile phones are disposed of each year, and huge numbers of them are made with dangerous materials like lead, mercury and fire retardants. Some even hold arsenic. In case you're prepared for an update, take a minute to discover where you can securely reuse mobile phones in your general vicinity.